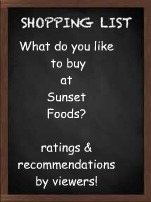 What are your favorite things to buy at Sunset Foods? Share your favorite finds with others and see their favorite picks too! What products, ingredients, produce, meat, deli items... do love to buy at Sunset? Share what's on your grocery list from this store and feel free to share any recipes or preparation methods you use for what you buy there! What do You Recommend at Sunset? I grew up on the northshore with sunset foods. It's a great store, were looking forward to having them in the neighborhood. Making a plan for what to make for dinner and making out a grocery shopping list takes time! I provide free weekly dinner menus and a printable grocery shopping list to help make home made dinners with ease. Contact me for information about advertising in this space.